Combining their interests in various musical and artistic styles, the TBM creates a captivating hybrid of 80’s electronica and aggressive guitars, curiously fused with cinematically dark melodic progressions. 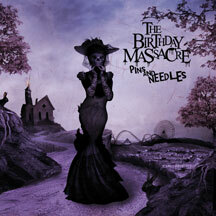 With Pins And Needles, The Birthday Massacre further refines the unique sound explored on the bands highly acclaimed previous albums. Pins And Needles is The Birthday Massacre at its best.